Oh the perversion, using an analogue film camera to photograph it’s zombified brethren, gutted and re-purposed as a hipster-tastic piece of furniture. This, dear readers, is a photograph of the desk lamp I received for Christmas, and it’s pretty cool I think you’ll agree. 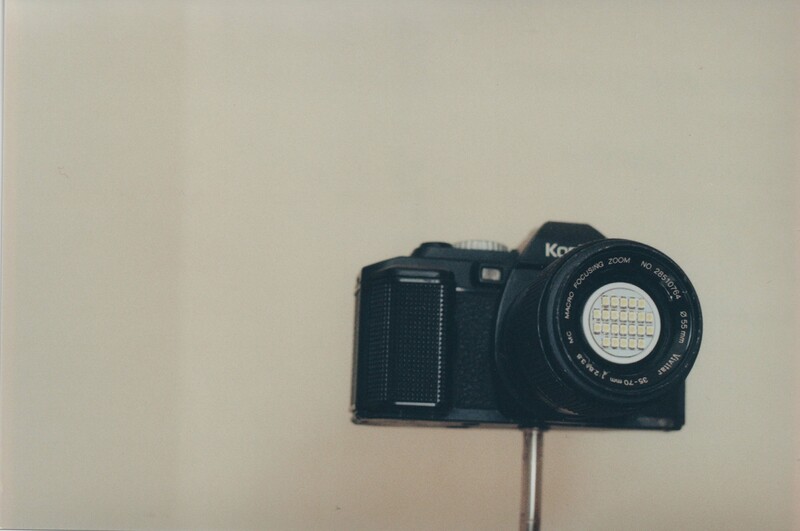 A broken and gutted Konica FS-1, customer made into a desk lamp. Taken with my Canon AE-1 Program and 50mm lens at f2.8, 1/15th sec on Kodak Colorplus ISO 200, expiry Jan 2014. It’s a simple image like this that I enjoy the most, you don’t need frame-filling detail everywhere, just simplicity and detail. The wording around the end of the lens barrel, the dimpling of the plastic on the hand grip, even the change in texture between handgrip, body and plastic patterning next to the lens. I feel the empty white background lends itself well to this image, making the lmap look more like an art exhibition piece than an everyday (although different to say the least) object. I like this lamp as it’s retained most of the former features of the original camera, the shutter speed selection dial on top still turns, the film wind crank still turns, and the metal pole it sits upon has been welded into the tripod head mount. The LED’s that jut out of the end of the lens could blind a police helicopter, it’s really that bright! I swear staring into the sun would do less damage to your eyesight. However as novelty items with a useful purpose go this is up there with the best of them, and after all who wants to see an example of simpler photographic times go to waste on the scrapheap?